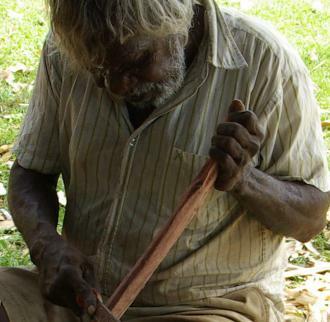 Walmajarri man Ned Cox makes traditional artefacts including coolamons, spears, shields, boomerangs and other cultural tools and objects. He uses the same techniques that were passed onto him by the old people. Ned is also an important cultural leader in the community and acts as a Cultural Advisor when required. He is a Law Boss, Singer, Painter and Carver. Ned has worked with young people and participated in cultural festivals and gatherings, to demonstrate woodcarving and how to make cultural artefacts in the traditional way. In addition, Ned explains how these objects were used in the old days.